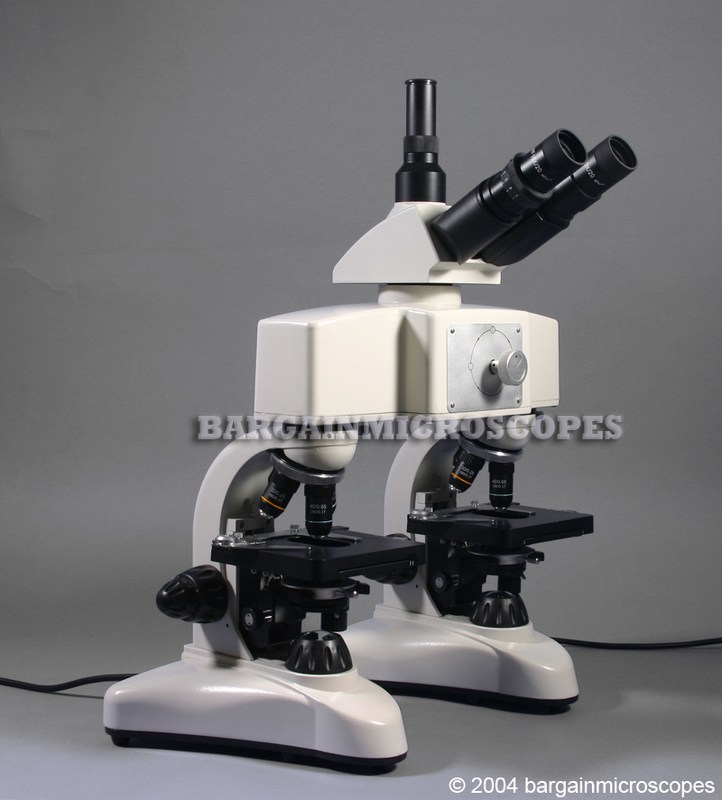 High Power Forensic Comparison Trinocular Microscope! Great for crime laboratories where comparison of biological forensic evidence is examined under high power compound light microscopes. Image of both forensic specimens is compared side by side in a split screen. The divider line is movable so either left or right side microscope image can be fully viewed or partially viewed. If partially viewed, the other side’s image appears. So image can be 100 percent of left, 100 percent of right, or any fraction. The dividing bridge optics has the unique ability to reverse the left and right image, so the left scope’s image is on the right of viewing field, and right is on the left. Also, the divider line is clean and with no thickness. Other forensic comparison scopes have a thick divider line obstructing the comparison process. 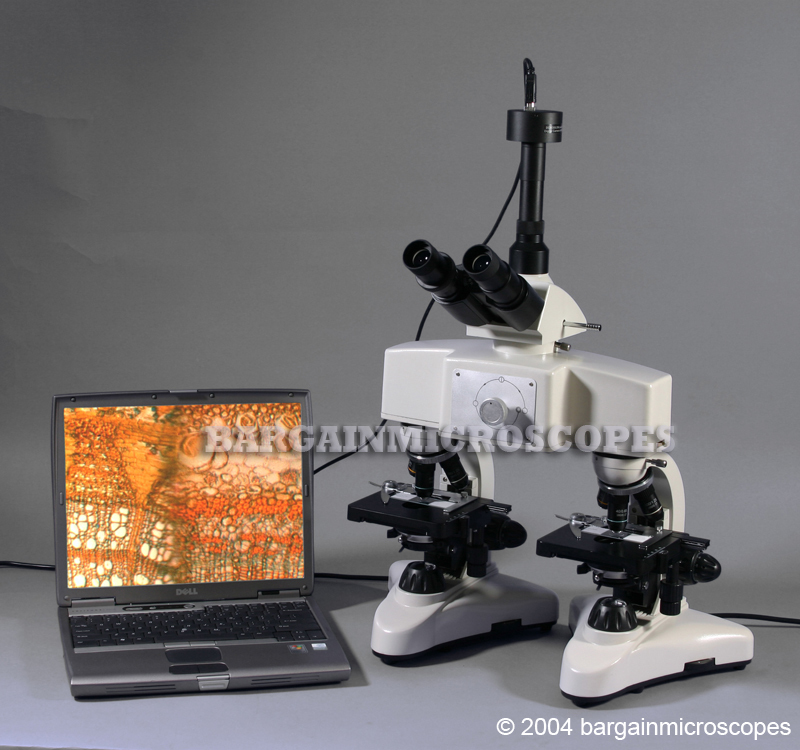 This forensic comparison microscope gives the cleanest division between images that we have seen. Perfect for crime scene investigation and forensic science educational classes! Forensically analyze and compare textile fibers, hair, dried paint, and various biological specimens on slides. The illumination source is contained in the base of each microscope and provides transmitted illumination to the forensic specimen. 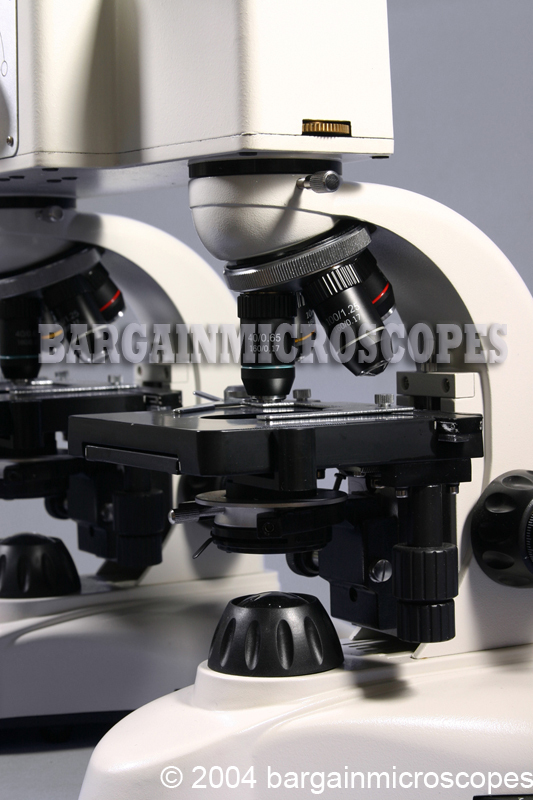 Each microscope has four brightfield transmitted light magnifications: 40x, 100x, 400x, and 1000x. 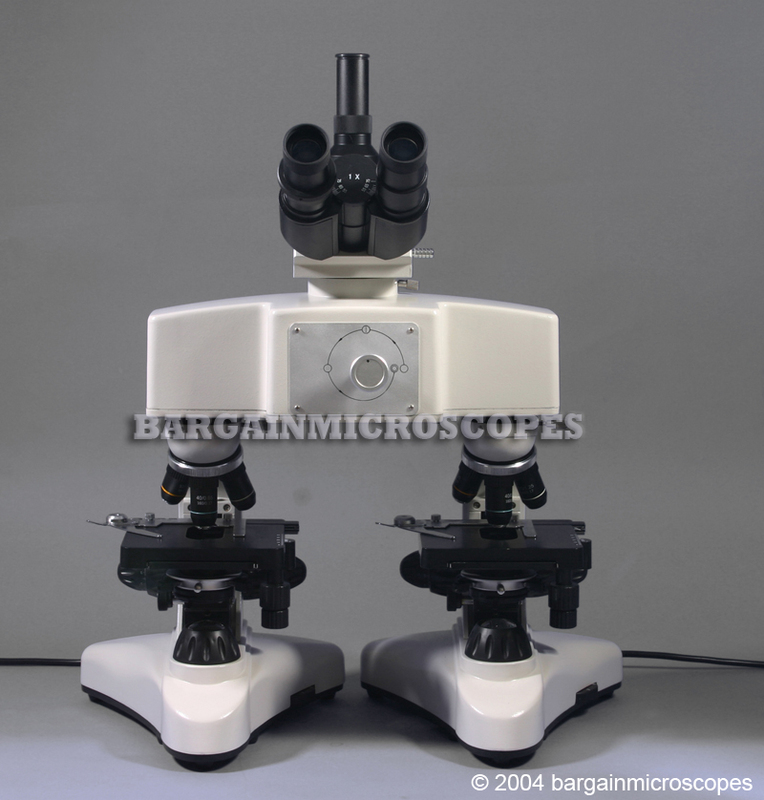 Each microscope has four brightfield achromatic DIN objectives: 4x (0.10 NA), 10x (0.25 NA), 40x (0.65 NA, spring loaded), 100x (1.25 NA, oil immersion, spring loaded). Eyepiece Set Included: 30mm diameter wide field 10x / 20mm Field. High eyepoint eyepieces, great for users with eyeglasses. Includes rubber eyeguards for blocking stray light. Variable Intensity 20W Tungsten Halogen Transmitted Base Illumination. 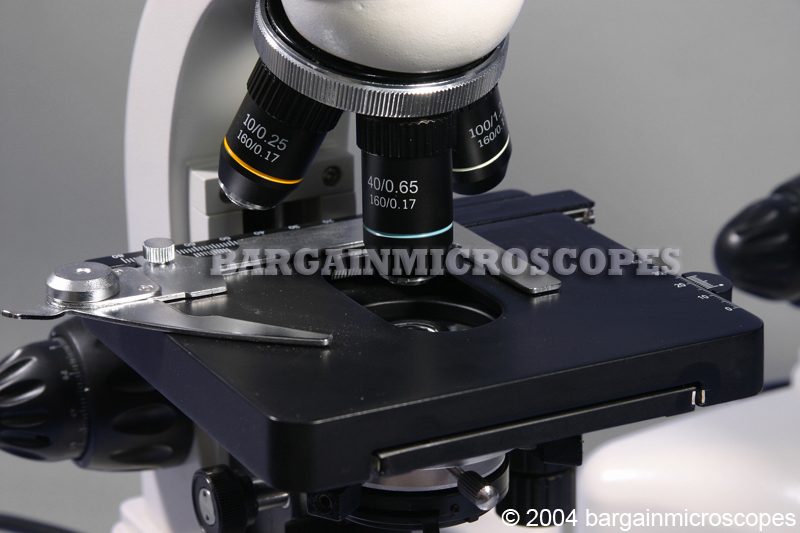 Each microscope has: 1.25 N.A. Abbe substage light condenser, condenser movement using rack and pinion gears, iris diaphragm and swing-out filter holder. Condenser Alignment Screws with condenser travel limit stop screw. Filters included for each of the two microscopes: blue, green, and yellow. Two Large Graduated Mechanical Movable (up/down and longitudinal Y-direction) Stages: 130 (X-dimension) x 125mm (Y-dimension). Low Position Coaxial X-Y Slide/Stage Movement Knobs – Range of Movement: 70mm (X-Direction) x 30mm (Y-Direction). 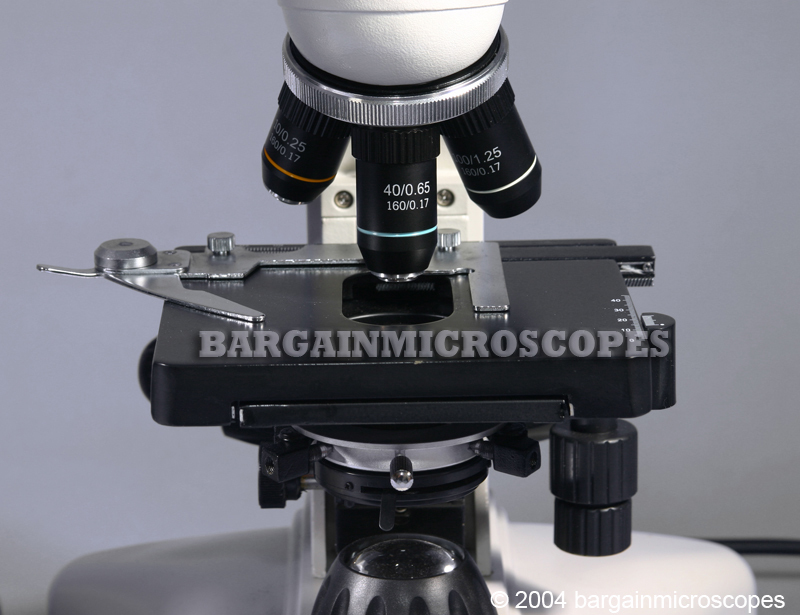 Fine and coarse coaxial focusing knobs on both sides of each forensic comparison microscope. Additional focusing adjustment on right side of comparison bridge to equate magnifications of each microscope. 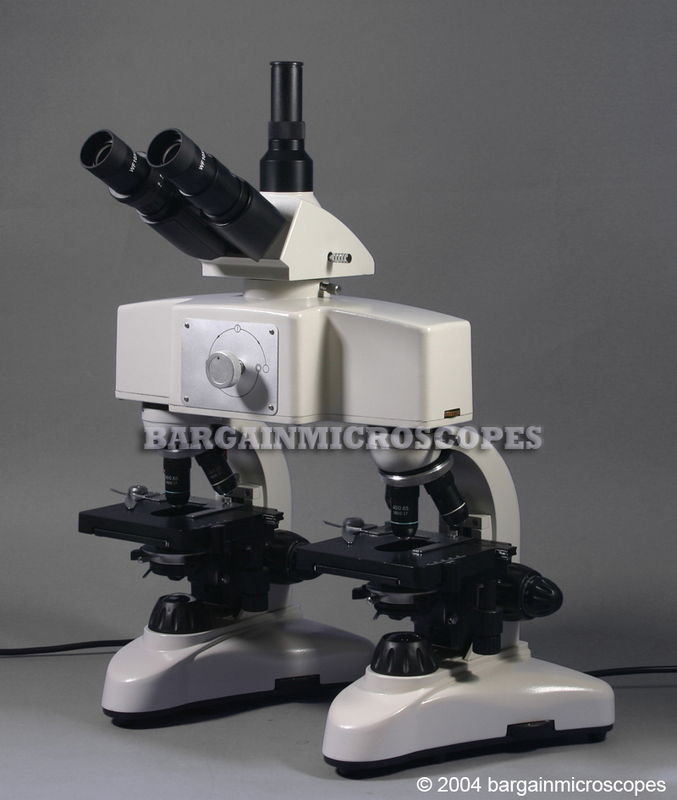 Total Overall Height of Microscope: 560mm. Includes extra bulb, fuse, and two bottles of immersion oil.